• After walking your pets, be sure to rinse off and dry your pets paws, legs and stomach to remove any ice and snow, ice melt or chemicals that are used to melt snow. Pay particular attention to between the toes. • If there are outdoor cats in your neighborhood, bang loudly on your car hood before starting the engine to give them a chance to escape. • Bring your pets in when the temperature drops below freezing. Cats and dogs are susceptible to frostbite and hypothermia and should not be outside for long periods of time. Very young and older dogs are more susceptible to the cold, so limit their time outside when the temperature is below freezing. If your pet has a heavy coat of fur and prefers the outdoors, County law requires a house of proper size that is dry, draft free and at least two inches off the ground. 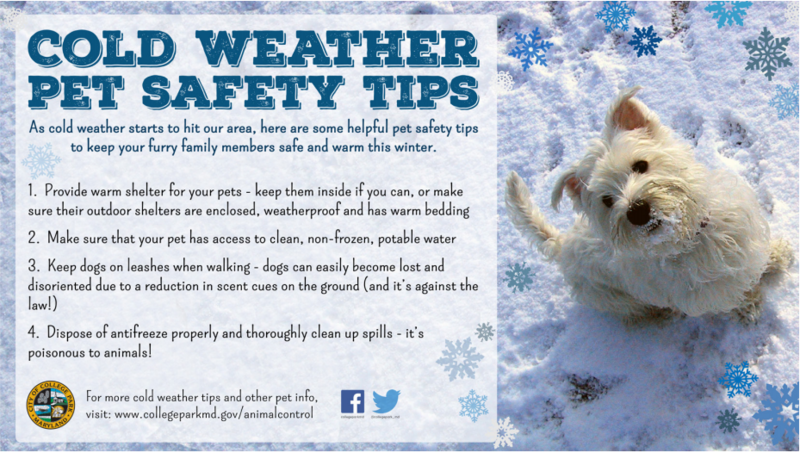 Make sure the pet has access to clean, fresh and not frozen water. • Antifreeze is a lethal poison for dogs and cats. Be sure to clean up any spills so your pet will not be tempted to taste. • Don’t leave your pets alone in cars in winter. Cars are just as dangerous in cold weather as in hot weather for your pet. Cars act as refrigerators and hold the cold and can cause animals to freeze to death.